Formula DRIFT Black Magic Pro Championship presented by BlackVue Dash Cameras returned to Evergreen Speedway for the Round 6: Autozone Throwdown. Points leader James Deane once again finishes on top of the podium to increase his lead in the Pro Championship standings. In the Top 4, number one qualifier and current points leader, James Deane in the Worthouse Drift Team / Falken Tire Nissan 240 faced off against former champion Dai Yoshihara in the Falken Tire / Turn 14 Distribution Subaru BRZ. It was a hard fought battle, but Deane was able to take advantage of an error by Yoshihara to move into the Finals. On the other side of the Top 4 bracket, former champion Fredric Aasbo in the Rockstar Energy / Nexen Tire Toyota Corolla iM faced Aurimas “Odi” Bakchis in the Falken Tires / Drifz Wheels / ARK Performance Nissan 240SX. Aasbo edged out his opponent to face the current points leader in a battle that could effect the rest of the season. Both drivers put it all on the line with the first battle too close to call forcing the judges to call a One More Time. The final battle was also very close, but after deliberation Deane was able to earn the victory to increase his points lead on Aasbo with only two events remaining. 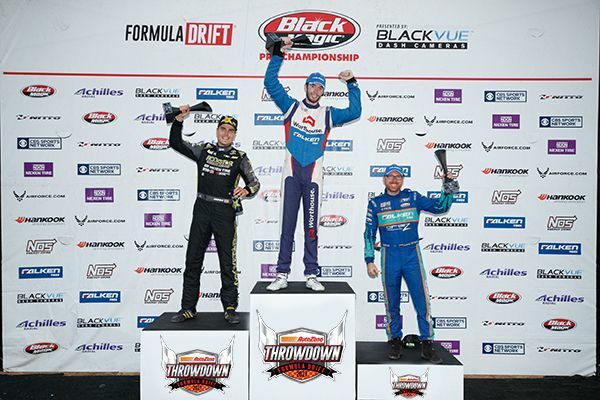 The action continues to Round 7: Showdown at Texas Motor Speedway on September 8-9. For more information visit, www.formulad.com and find Formula DRIFT on Instagram @formulad, Facebook www.facebook.com/formuladrift, Twitter @FormulaDrift, and Snapchat - formula_drift. Tune into Formula DRIFT on CBS Sports and check your local listings for airtimes.